I wonder where all the flowers is? Well, here the Legislative Report is, if you’re still out there, Mr. Schafer. 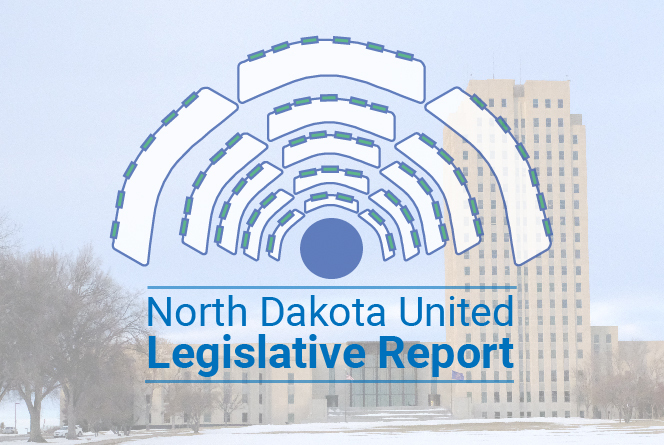 First off, why don’t you take a moment or eight, and check out the NDU Legislative Update, featuring President Nick Archuleta and Public Affairs Director Tom Gerhardt? You’ll thank me for doing so. It was a busy week, and I’ve even got a couple important updates on the things they mentioned from Friday. Ready to thank me? No? That’s fine; most people don’t. Time to Legislative Report! State employees, and higher education faculty and staff, certainly know this, but those workers’ yearly raises are determined each session of the North Dakota Legislature, and in the previous session, legislators chose to not give raises to public employees for the biennium we’re in currently. We all know that costs of living didn’t freeze, too, so our state employees and higher ed personnel have been moving backwards for the last two years. It’s time for that to end, and for our public workers to receive an overdue increase in compensation. The Senate and House Appropriations Committees have been discussing competing plans for pay raises. The Senate had called for 2% increase in the first year, and 3% increase in the second year. The House has countered with a plan consisting of a 2% increase in the first year, with a minimum of $120 per month, and a maximum of $200 per month. Close to 80% (79.5 or 5,504) of employees will benefit from the minimum, while only 46 people will see their increase lowered by the max. Those statistics only include state agencies, and does not reflect higher education. In the second year of the House’s plan, employees would receive a 2.5% increase, with no minimum or maximum amount. This negotiation on state employee compensation is still very fluid, and could potentially keep changing until Sine Die. So stay tuned and, in the meantime, enjoy this picture of our own Tom Gerhardt led his Lobbyist 2 team to a second-place finish at the Capitol City Classic XV yesterday! 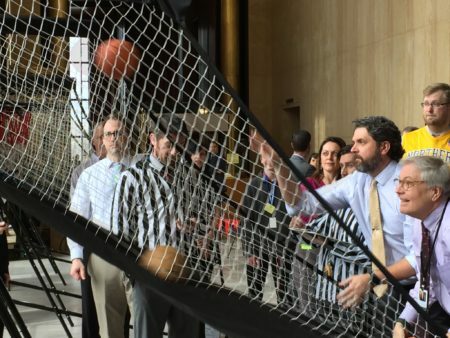 Eight teams participated, including elected officials, lobbyists and the media. Together, they helped to raise over $10,000 for the Special Olympics! Nothing but net! HB 1206 was a bill “relating to possession of a concealed firearm or dangerous weapon at a public gathering.” This would have included schools, sporting events, public universities, churches, etc. “We asked that an amendment be put in,” President Archuleta said, “and it was to exempt college campuses and high school football games and other events and whatever else. Churches were left out at first and they were put back in. All those amendments went in and then after they looked at the bill with the amendments, they decided that this really didn’t offer much clarity. And so they voted to kill it.” The committee gave “do not pass” recommendation, by a vote of 5-1. The bill went for a floor vote yesterday, and it failed, 11-36. Later that afternoon, HB 1332 went up for discussion and a vote on the Senate floor, and it passed, 31-14. The bill will allow schools to develop a plan, which must be approved by local law enforcement and the Department of Homeland Security, to be submitted to the North Dakota Department of Public Instruction, for an “armed first responder,” who cannot be anyone with direct supervision of students. There are rigorous training requirements, and the bill was amended to keep these plans confidential. Good news! 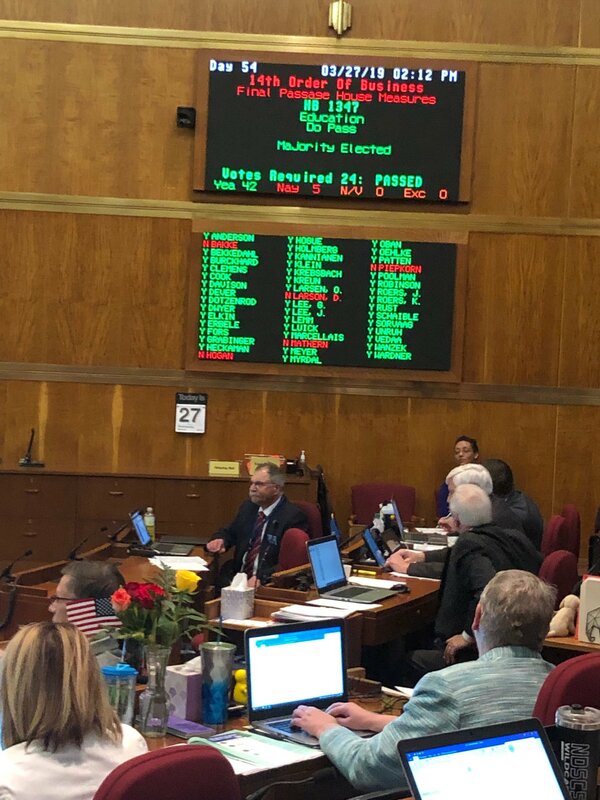 We won on HB 1347, the bill to increase the probationary period for teachers! Kind of! A vote was taken on the amendment. It passed, 33-14. Then the new bill, requiring only two years of probation for new teacher hires, went up for a vote, and it passed, 42-5. I just so happen to have a roll call for the amendment to this bill, reducing the three years of probation to two. It’d be great if you could look through the list, find your district’s senator, and send them a note of thanks if they voted “yea” on the amendment. Or a note of disapproval if they voted “nay,” but please be polite. We are all adults, as are they, and we should be able to talk to each other about our differences, without insults, like adults do. I’m Kelly Hagen, NDU communications director, and I don’t really have an ending planned out. So … what I will do is urge all of you to please attend the Regional Assembly nearest you! We will be hosting the East Regional Assembly in Fargo on Saturday, April 6, at the Holiday Inn, with a social the night before. And then we’ll have our West Regional Assembly in Bismarck, at the Radisson Inn, on Saturday, April 13, with a social the night before, too. I’ll see you in Fargo this weekend, and back here next week!